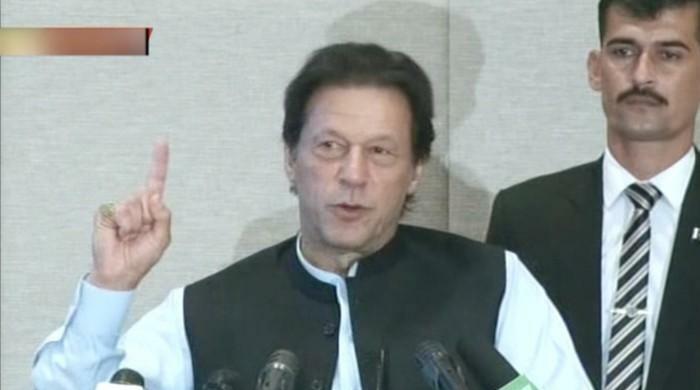 ISLAMABAD: Prime Minister (PM) Imran Khan on Friday urged the bureaucracy to support the government through a “down cycle” time and help implement the government’s “out-of-the-box” policies. He also said that the country’s debt currently stands at Rs30 trillion. “We do not have money to run the country,” he revealed. “Majority of the population is young and looking for jobs; and the loans we took, instead of creating wealth so that we could repay them, have created projects that are running losses,” the PM added. “Institutions were destroyed for misappropriation of funds,” the PM stressed. “We trained them, did the selection on the basis of merit. And they are now a model police force that we hope to replicate in Punjab, Sindh and Balochistan. We want our bureaucracy to be the same way ─ promoting people on the basis of merit, isolated from political pressure. When your performance is built on merit, you rise to the top on your own,” he added. The PM vowed to improve the structure of governance within two years. “Investors don’t come to Pakistan owing to governance,” he explained. “In 1935, I was reading that a commissioner with his salary could buy 70 tolas of gold. My father, who was a government engineer in the 1970s, could buy a car with one month’s salary. Because bureaucrats had good remuneration, there was no temptation. The living wage is not enough for you to survive on your salaries,” the PM explained. “Overseas Pakistanis ─ you can’t imagine how much money they have ─ that money doesn’t come here because of a lack of faith in governance. We will have so much money for the salaried class that you will be able to give your children quality private education,” he said. “There is nothing to worry about. Bear with some difficult times, they won’t last long,” he added. “Maybe God has created this crisis because he wants us to change. We will change when we start thinking, before spending a single rupee, of the children who are out of school,” the prime minister said. Look at Singapore: they have exports of $303 billion but we have exports of $20bn. They have a knowledge economy. We have so many universities here that feature in the top 500 in the world,” he stressed. “Third world countries are poor because of corruption,” he explained. “We will not progress until we change ourselves. Everyone from the public to politicians and bureaucrats must change themselves,” PM Khan asserted. “We are paying Rs6 billion in interest on loans every day,” he shared.